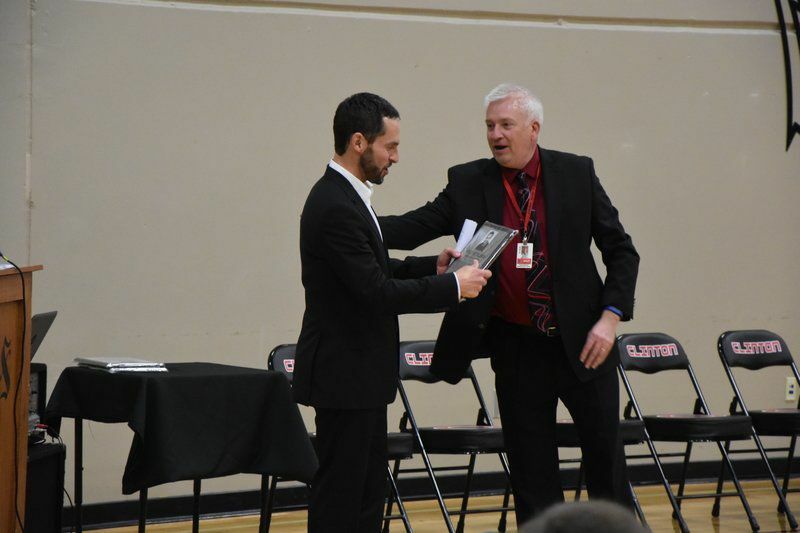 Jake Mosbach/Clinton HeraldKyle Ketelsen, left, receives a plaque noting his induction into the Clinton High School Hall of Honor on Friday at CHS. Jake Mosbach/Clinton Herald(From left) Dr. Fred Luthans, Sandra Fullterton Joireman, and Kyle Ketelsen pose Friday at Clinton High School after their induction into the inaugural class of the CHS Hall of Honor. The Hall was established to celebrate the professional and personal successes of CHS alumni in fields such as academia, humanitarianism, and the fine arts. Other inductees included William Conner and Krista Voda Kelley. Jake Mosbach/Clinton HeraldClinton High School students who are part of the culinary arts program serve lunch to attendees of the 2019 CHS Hall of Honor induction banquet. Created to highlight the academic, humanitarian, fine arts, and other personal successes of CHS graduates, the Hall saw its first five members enshrined Friday. The inductees are William Conner, an 1893 graduate who would go down in United States Military lore; Sandra Fullerton Joireman, a 1986 graduate and current University of Richmond professor and author noted for her humanitarian efforts in poverty-stricken countries; Kyle Ketelsen, a 1989 graduate who has garnered international praise and demand for his opera talents; Dr. Fred Luthans, a 1957 graduate who has authored more than 50 books and 200 academic articles, mostly regarding business and economics; and Krista Voda Kelley, a 1992 graduate noted for her television presence on networks such as Fox and NBC. Clinton School District Superintendent Gary DeLacy stood proud Friday as he welcomed the honorees to the new group, one that will see many more distinguished names in the years to come. 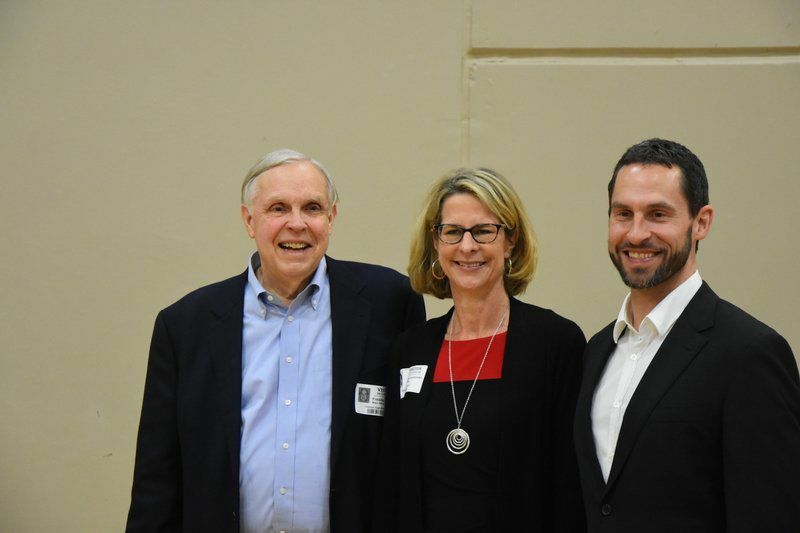 "The mission of the Clinton High School Alumni Hall of Honor has been established to recognize those who attended Clinton High School and have distinguished themselves in their careers, communities and personal lives. These individuals are held up to Clinton students as examples of citizenship and success," DeLacy said Friday. Honoree Ketelsen had a message for young students who may be needing words of encouragement as they slowly figure out which path their lives are headed down. "I would advise you to never expect to be handed anything, you've got to work," Ketelsen said. "But there is good news. Each of you students are capable of putting in all the work. No matter what you want to do in life, always be open to hard work." The inductees all thanked family and friends, but also the teachers and administrators at Clinton High School who they remember pushing them to be the best students they could be, ultimately shaping an important part of their lives. Luthans, who now lives in Nebraska but ensured the audience he remains a die-hard Iowa Hawkeye fan, recalled the values instilled in him during his time at CHS. "Things like honesty and integrity, things like hard work and humility," Luthans recalled. Luthans said those core values taught him to be successful in not only his professional life, but more importantly his personal and family life. Though not able to attend the event in-person, Voda delivered a video message to family and friends, along with those who nominated her for the honor. High school years are certainly formative for young students, and Voda said in her message that she considers herself fortunate to spend those years at CHS. "(The walls of CHS), that building, where you're sitting, and the people...they're a big part of my success, and they will be a big part of your story, too," Voda said as she aimed her message towards current CHS students.